4T Sverige, the joint venture company set up by Sweden’s four mobile network operators, is to launch a mobile payments service that works with 97% of current phones and also provides support for NFC. 4T Sverige, the mobile payments joint venture established by Sweden’s four mobile network operators, has picked local firms PayEx and Accumulate to supply mobile wallet technology that works with nearly all of today’s mobile phones as well as supporting NFC payments. Payments processor PayEx will develop and operate account holding and infrastructure services for 4T while the mobile wallet application and mobile security will be based on Accumulate’s ME mobile security platform. 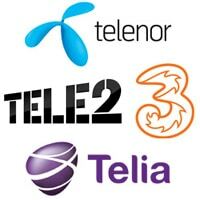 The four carriers — Telia, Tele2, Telenor and 3 — formed the joint venture in November and plan to begin commercial services in mid-2012. 97% of Swedish mobile subscribers will be able to use the new mobile payments service from launch to make online payments, person-to-person transfers and man-to-machine transactions through vending machines and parking meters. All four mobile network operators will deploy the same mobile wallet solution to their customers so that subscribers will get the same payment options and ‘look and feel’ regardless of which operator they use.